Did you know? All Saints is running a #GiveLove campaign this year headed by Mrs. Cash and the Speak Up Club. Below are some of the things the group has accomplished this year. There will be more to come in the second semester! We hope you will partner with the school and encourage your child to Give Love by speaking up against meanness towards others and looking for ways to be kind to others. 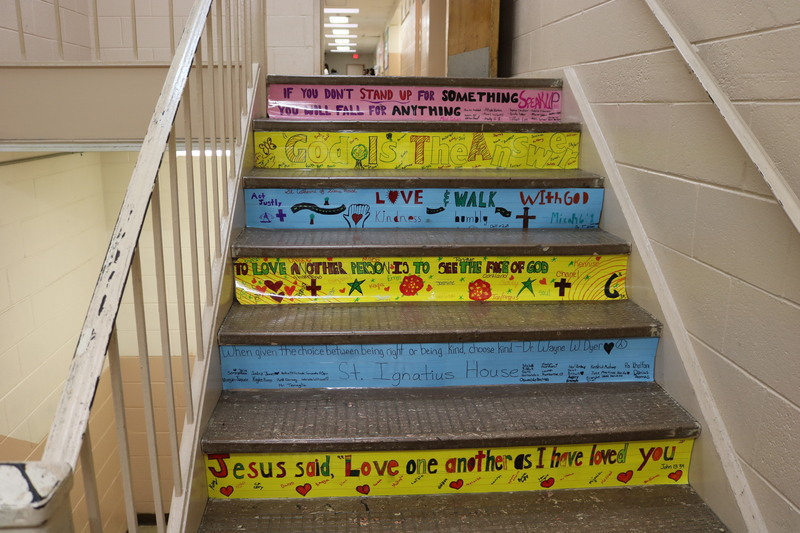 Each homeroom created a banner to promote kindness and acceptance and these banners are displayed on our stairwell steps. Each homeroom did a project to express love to others during Advent. Our school counselor, Mr. Burgess, has conducted classroom lessons on the importance and “how to” of speaking up against meanness and bullying. Students have just begun to watch weekly videos on speak up strategies. Student representatives in grades 7 and 8 attended a Prejudice Awareness Workshop and are sharing ideas learned with the Speak Up Club. Speak Up Club is partnering with The Richmond Center for Peace Education for training on promoting peace in school and peer mediation. The Richmond Center for Peace Education is leading student training on peace promotion to our Speak Up Club and Prejudice Awareness Group members. Our 5th graders attended the Compassion Experience last week where they learned how organizations and individuals can make a difference for children in developing countries. Our SGA and Speak Up Club leaders are encouraging all students to get involved in our community service efforts through posters and special announcements.